Happy Tuesday! 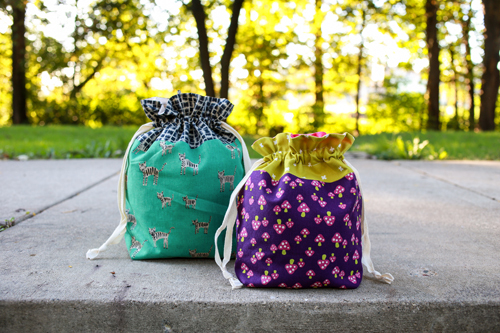 One of the mini goals I set for this month was to make some lined drawstring bags using my canvas/home decor fabric stash. I have a few made from canvas, and I'm always grabbing for them. They're just a little sturdier than the quilting cotton versions. I love collecting canvas prints, so I had no shortage of prints to choose from for these bags. And of course, I couldn't make just one! I decided to make two each of the Everything size (same size as the tutorial version), and the Project size (available in the pattern). These are the sizes that I use the most and they have so many uses. I use them to separate things when I travel like power cords, socks, shoes, etc. 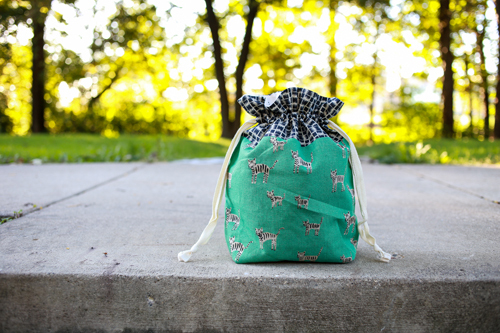 They're also my go-to bags for my knitting projects. The Everything size is great for hats and smaller projects. The Project size is good for shawls or anything with more than one skein of yarn. First up, an Everything bag! 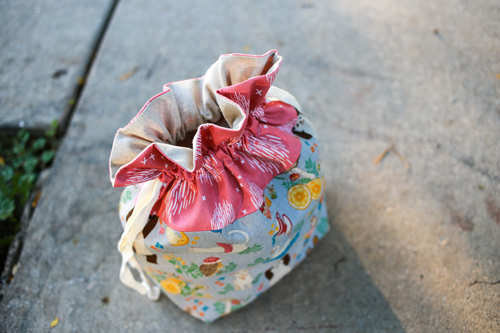 For this bag, I used up this cool Nani Iro canvas scrap that I snatched off our fabric table at retreat last month. There was just enough to squeeze out a bag! I used Essex cotton/linen for the accent and a teal print from Imprint by Katarina Roccella for the lining. I pulled fabrics in pairs, so I have two somewhat coordinating sets. 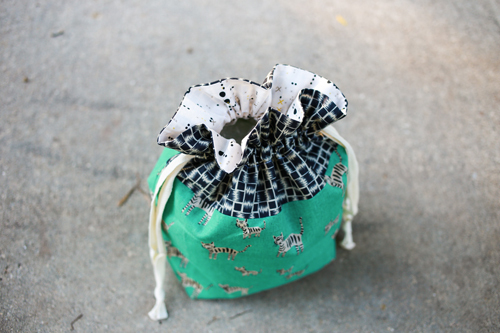 The Project bag to match uses this cute tiger print from Hatbox by Alexia Marcelle Abegg. I've been hoarding this one for a while! A favorite Hope Valley print for the accent and the lining is a print from Gramercy by Leah Duncan. 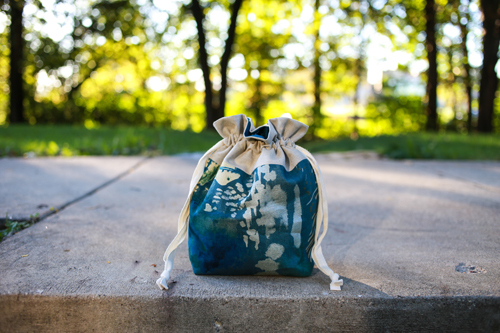 This Japanese mushroom print was screaming to be a cute little drawstring bag! 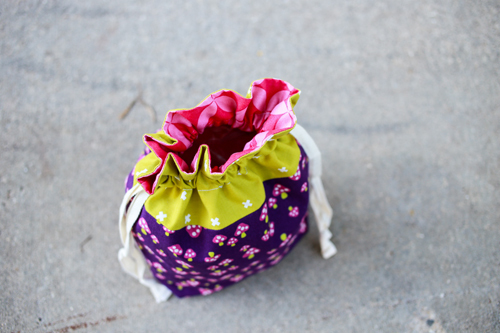 I wanted to keep this bag fun and playful, so I continued to pull bright colors for the rest of it. A Cotton & Steel basic for the accent and a Good Folks by Anna Maria Horner print for the lining. 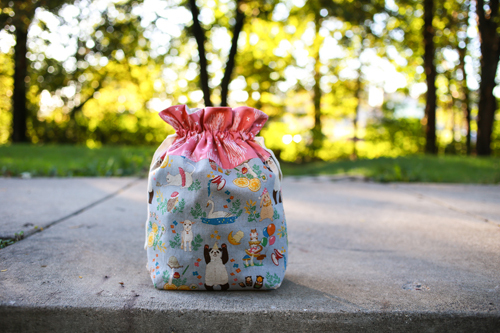 For the second Project bag I used this adorable Kokka print. The accent is from Etno by Pat Bravo and I used more Essex cotton/linen for the lining. 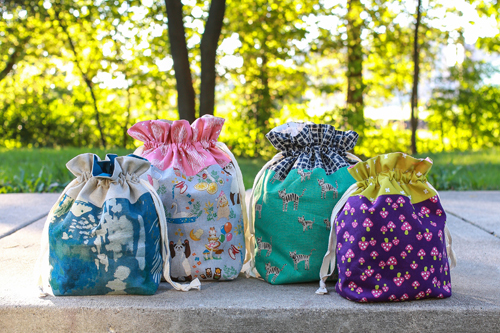 Making these bags from canvas or home decor weight fabrics couldn't be easier! 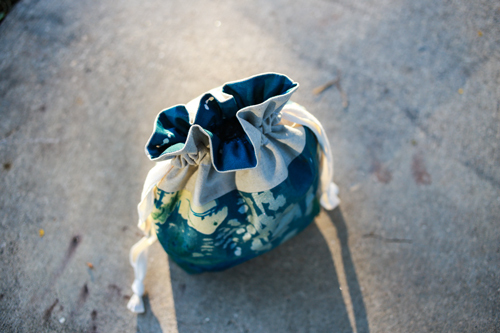 I do try to avoid using anything heavy for the accent pieces, so that it doesn't interfere with the drawstring. With that being said, on the first Everything bag I used Essex for the accent which is heavier than quilting cotton and it's fine! I still wouldn't use anything too thick though. I finished off all the bags with some natural cotton twill tape. I buy mine from here. Making some of these has been tickling around in the back of my mind. Think they'd be great Christmas gifts, or gift holders that become a gift. Thanks for the reminder that I need to snag your pattern and get cracking. Nice project bags!! I really need to make some more to use up some stash... if only there were more sewing hours in the day. 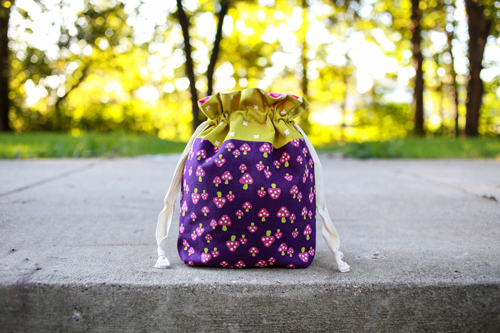 I just love your drawstring bag pattern. Every time my 6 year old daughter gets invited to a birthday party I whip up one, pop in a few little gifts and done,a cute present where the wrapping is also the gift. They all seem to love them and so do the mums. Win win! I love making these bags. Choosing the fabric is half the fun. Love these bags!! I've made a few before from your tutorial but you've inspired me to make a few more :) Thanks for sharing!! Using canvas is a great idea. Can't wait to try it out. Those bags are really cute. I can see many uses for them.